It seems like every designer and their mother has created a bow blouse this season. And… I kind of adore them. I imagine they’ll flatter just about every size. How cute does Emma Pillsbury look in last week’s episode of Glee? That blouse was the only novel thing in the entire episode. Let’s not discuss how she’s affording Marc by Marc Jacobs on a high school counselor’s salary and instead focus on which color is cuter. I’m a sucker for pink. Tory Burch has created quite a few designs as well. I love this geometric printed sleeveless one best. According to the website, the bow detaches. I don’t know what that means but I’m picturing clip on bow-ties. Tory wouldn’t do that, right? 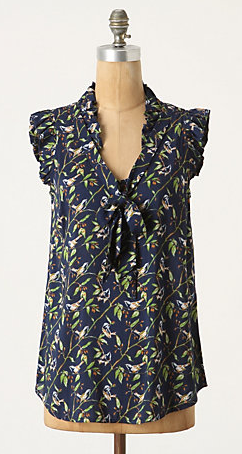 This one from Anthropologie is more affordable; and it has a cute bird pattern that would be great for fall. There’s also a ton of solid colored bow blouses around. Alice & Olivia’s has button-tab secure cuffs for rolling up the sleeves. This feature makes the garment a bit edgier than the bow blouses with gathered or ruffled sleeves. 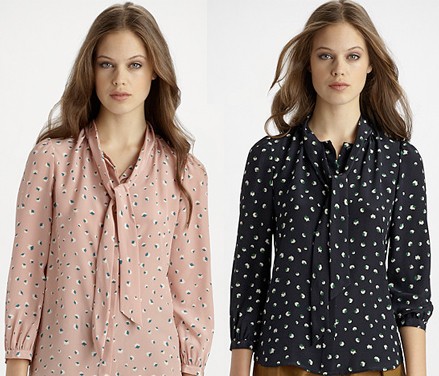 Have you noticed the fashion saturation of the bow blouse? Any favorites you’ve found? lovely post. loved your comment, too!